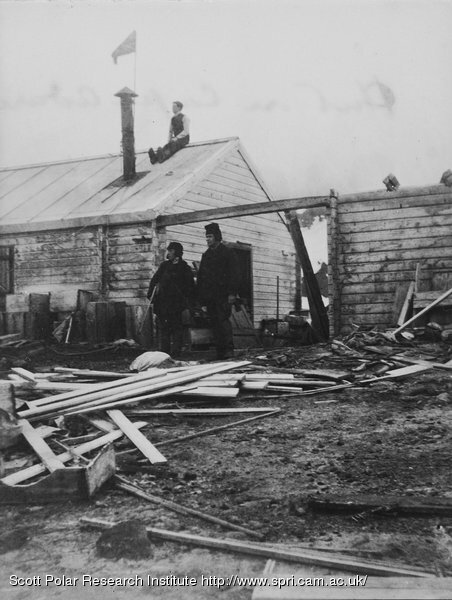 Summary text: Two men standing outside the hut. One man sitting on the roof. Planks of wood and other materials on the ground. The Union Jack is flying from the chimney. This entry was posted on Thursday, February 5th, 2009 at 7:38 pm	and is filed under Photos: Antarctic Relief Expeditions 1902-04. You can follow any responses to this entry through the RSS 2.0 feed. Both comments and pings are currently closed.